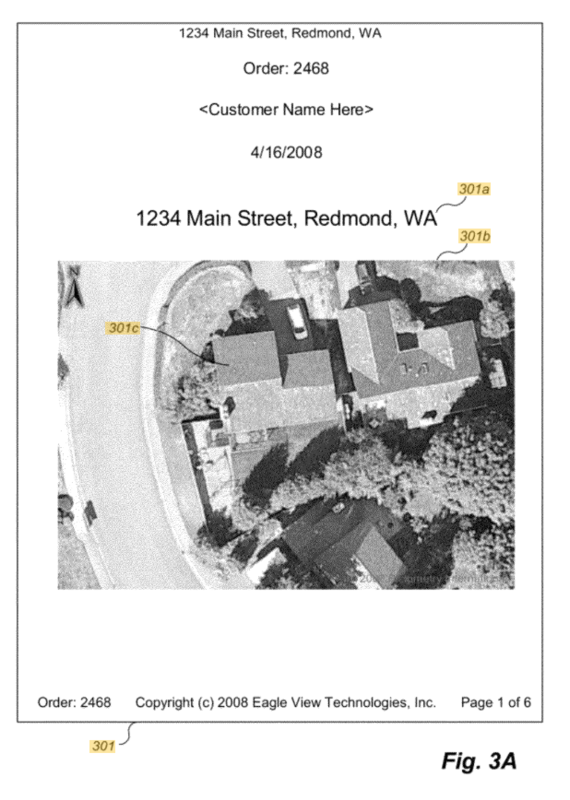 Both of these companies use drones to measure houses — their reports are then used for roofing, solar, and insurance estimates. In 2015, Eagle View sued Xactware for patent infringement — that case is ongoing. Meanwhile, Xactware filed a series of inter partes review petitions – the subject of the appeal here. For its part, the PTAB agreed to hear the IPRs — finding initially that the petitions had merit. Ultimately, however, the PTAB sided with the patentee and found in its final decision that the challenged claims were not proven invalid. On appeal, the Federal Circuit has also affirmed. Nexus between Secondary Indicia and the Claimed Invention: The briefing focused on Eagle View’s secondary indicia of non-obviousness. The service is clearly commercially successful and has been lauded with industry praise for solving solving a long-recognized problem. Xactware argued, however, that these secondary indicia did not have a close enough nexus with the particular inventions claimed in the patents. Without discussion, the Federal Circuit concluded that the Board’s finding of nexus was supported by substantial evidence. Presumption of Nexus. The court did not touch the trickier question of presumption-of-nexus. Patent claims are presumed patentable and non-obvious. Thus, any obviousness challenge must present evidence sufficient to overcome that presumption. Secondary indicia of nonobviousness are akin to rebuttal evidence — only needed if the challenger meets that initial prima facie burden. Secondary indicia of non-obvousness involve two important elements (1) the indicia itself (such as commercial success or industry praise of a product); and (2) a nexus between the indicia and the claimed invention at issue. This second element – nexus – is generally more difficult to actually prove. However, the Federal Circuit has created a presumption-of-nexus doctrine. We assume a nexus if the patentee shows that the successful/praised product (1) “embodies the claimed features” and (2) is “coextensive with the claimed features.” Brown & Williamson Tobacco Corp. v. Philip Morris Inc., 229 F.3d 1120, 1130 (Fed. Cir. 2000). Here, the “coextensive” requirement prevents presumption-of-nexus when the claimed invention is just a small component of a multi-component product. However, we have an ongoing debate on how to know when a product has too-many non-claimed-features to still be coextensive with the claims. Although the parties asked for further guidance on this issue, the Federal Circuit ruled that no determination on presumption-of-nexus was necessary because the patentee had provided actual proof of nexus — that the claimed features were the cause of the success/praise/etc. Of note, the first result of my Google search for “xactware” is an advertisement for EagleView. I am amused but not confused. See Eric Goldman, Another Court Says Competitive Keyword Advertising Doesn’t Cause Confusion, Technology & Marketing Law Blog (2018). a processor configured to:  detect a noise level during an inspiration phase of the breathing cycle with said sensor;  detect a noise level during an expiration phase of the breathing cycle with said sensor;  determine an occurrence of a snore based on a difference in the noise levels detected during inspiration and expiration, the difference comprising a subtraction of the noise level during expiration from the noise level during inspiration. Alder. This case followed the other recent PTAB decisions regarding the 2019 Eligibility Guidelines. In particular, the decision recites elements of the guidelines but then makes no real effort to actually apply the guidelines to the case-at-hand. Rather, the decision follows the usual approach of drawing analogy to the various appellate and Supreme Court cases to find the closest thread. Whether the phrase “[a]ll the expenses of the proceedings” in 35 U.S.C. § 145 encompasses the personnel expenses the United States Patent and Trademark Office incurs when its employees, including attorneys, defend the agency in Section 145 litigation. When an examiner refuses to allow an applied-for patent, the applicant can appeal to the USPTO’s internal administrative board (PTAB). If still unsuccessful, the applicant then has a choice of either (1) filing a civil action in federal court or (2) appealing directly to the Court of Appeals for the Federal Circuit. 35 U.S.C. § 145. In prior cases, the Federal Circuit has held that “all the expenses” means that applicant must pay the expenses win-or-lose, including the USPTO’s taxable costs. Hyatt v. Kappos, 625 F.3d 1320 (Fed. Cir. 2010) (en banc). In NantKwest, the USPTO asked also for its attorney fees as part of “all the expenses.” (Note, the USPTO doesn’t hire outside attorneys to handle these, but it calculated its in-house attorney time and requested $100,000+). The original NantKwest panel sided with the USPTO — holding that “expenses” include USPTO attorney fees. However, a 7-4 split of the en banc court changed direction and held that “expenses” does not include attorney fees. In its decision, the Federal Circuit focused on the traditional presumptive “American rule” on attorney fees (each party pays for its own attorney fees) and found that the “all the expenses” language was not sufficiently “specific and explicit” to overcome the presumptive rule. In a separate fees case, the Court today issued an opinion in Rimini Street Inc. v. Oracle USA Inc., holding that that the copyright act’s allowance of “full costs” only extends to traditional “taxable costs” and does not include, for instance, expert witness, e-discovery, or jury consultant fees. 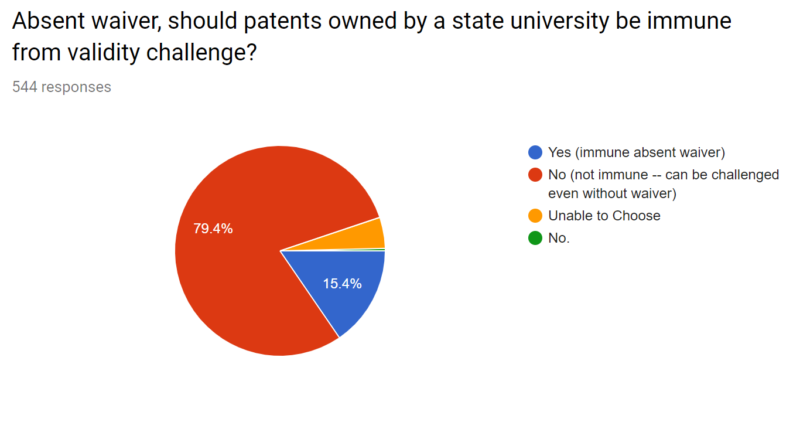 Bottom line: Patently-O readers overwhelmingly feel that patents owned by state universities should not be immune from validity challenges. It means herein immediate, temporary and sustained relief which starts within about 5-10 minutes following ingestion of the active ingredients and continues and remains constant for at least about 4-6 hours after ingestion of the active ingredients. Johnson & Johnson exclusively licensed the patent and listed it in the Orange Book listing for Pepcid Complete. However, when Perrigo filed its generic ANDA and Paragraph IV certification, J&J chose not to file suit, but rather sued on a different listed patent and lost. At that time, the ‘137 patent was also removed from from the FDA Orange Book listing. (I don’t know why). In the present case, the Massachusetts jury sided with the patent holder — finding the patent enforceable and infringed and awarding $10 million in past damages (the patent expired in 2012). However, in a post verdict decision the district court rejected the jury verdict — holding instead that no reasonable jury could have found infringement based upon the evidence presented. Looking here at the infringement analysis, the patentee argued that the accused product included the same ingredients as Pepcid Complete, which is covered by the patent claims. In this copy-cat situation, however, the decision maker has to be careful to focus on the patent claims, not simply compare the copied products. Here, the district court considered the clinical evidence presented at trial and found that it “did not demonstrate that Pepcid Complete provided immediate relief from episodic heartburn.” In particular, the evidence showed relief within 15 minutes, but not the 5-10 minutes required by the definition of immediate. On appeal, the Federal Circuit has affirmed. Although the patentee presented evidence of very rapid change in esophageal pH after taking the drug (within 5-10 minutes), the court found that a change in esophageal pH does not directly correlate with immediate relief of episodic heartburn. At most, the study suggests that Pepcid Complete might provide immediate and sustained relief; such speculative data, however, cannot sustain Brigham’s burden of proof. A related study did show fairly-rapid action, but the shortest period measured was 15 minutes. There is no dispute that adequate relief first measured at 15 minutes after administration is a parameter different from relief starting 5–10 minutes after administration. . . . As Studies 110 and 127 did not measure the result that Brigham claimed in the ’137 patent, we agree with the district court that they do not support the jury verdict. . . . Because only speculation supports Brigham’s contention that data showing adequate relief at 15 minutes implies that relief started within 5–10 minutes, it cannot sustain the jury verdict. below or any other decision. Although Hickma does a good job of nit-picking, the underlying reality is important — the Federal Circuit’s decision in Vanda is not easily reconciled with its Ariosa decision or the Supreme Court’s decision in Mayo v. Prometheus. And, the Federal Circuit and USPTO have effectively green-lighted patents on methods of treatment that would be ineligible if recharacterized as methods of diagnosis or creating a treatment plan. Brief amici curiae of Intellectual Property and Innovation Professors, Engine Advocacy, et al. The amicus briefs in this case all focus on the same issue — arguing that the Federal Circuit’s Vanda decision conflicts with Mayo and Flook. The Law Prof brief explains: “The Federal Circuit’s decision effectively overturns this court’s precedents, thwarts the proper development of patent eligibility law, and will lead to countless improperly issued patents.” The Law Professor Brief was filed by Stanford’s IP Clinic – although neither Mark Lemley nor Lisa Larrimore Ouellette signed-on. Professors Josh Sarnoff (DePaul) and Katherine Strandburg (NYU) substantially drafted the brief. Top pharma-patent litigator Douglass Hochstetler (KelleyDrye) filed the AAM brief. Administering iloperidone at a lower dose to predicted poor metabolizers in order to reduce the risk of “QTc prolongation” for poor metabolizers. In the case, iloperidone was already known as a drug treatment and it was also known that some folks were poor metabolizers in a way that created the particular health risk and that a lower dosage is still effective for poor metabolizers (since the drug stays in the body longer). A remaining problem solved by the inventors was how to predict who should get the low dosage. The core discovery here is that a genetic difference substantially explains the risk. The inventors made that important discovery and then implemented it with straightforward administration steps. The question then is whether this approach is patent eligible. 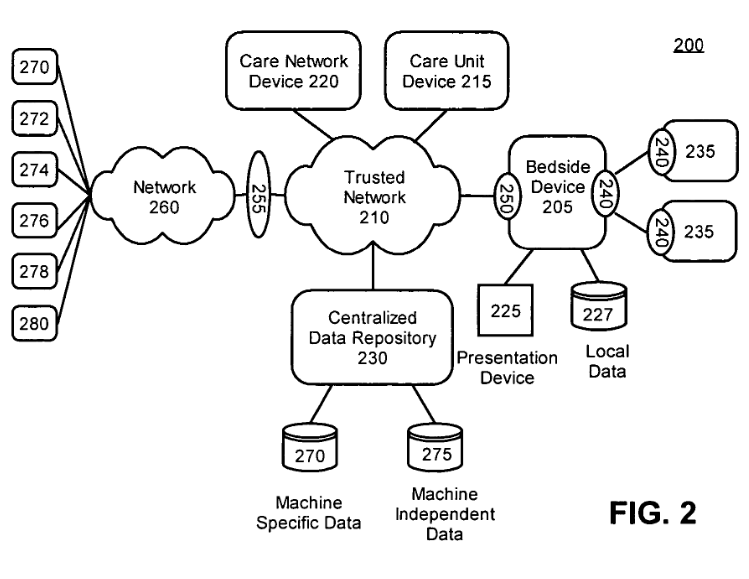 UF’s asserted patent is titled “Managing Critical Care Physiologic Data Using Data Synthesis Technology.” U.S. Patent No. 7,062,251. From the patent title, keen Patently-O readers will recognize a potential eligibility problem. N.D.Fla. District Court Judge Mark Walker dismissed the case on a R.12(b)(6) motion without taking any evidence — finding the asserted claims ineligible as a matter of law. On appeal, the Federal Circuit has affirmed. 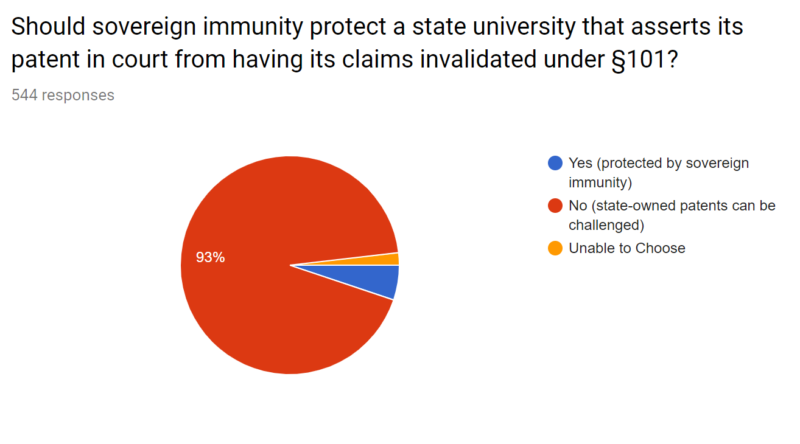 Sovereign Immunity: Before reaching the merits of the eligibility claim, the Federal Circuit first addressed Florida claim of Sovereign Immunity under the 11th Amendment of the U.S. Constitution. In a prior decision, the PTAB refused to consider an inter partes review (IPR) challenge of the ‘251 patent based upon sovereign immunity grounds. IPR2016-01275 (note – this is a questionable decision under St. Regis Mohawk). The 11th Amendment has been seen as quite strong — preventing the Federal Courts from hearing “any suit in law or equity, commenced or prosecuted against one of the United States by Citizens of another State, or by Citizens or Subjects of any Foreign State.” U.S. Const. amend. XI. The for UF here is Waiver — UF filed the infringement lawsuit against GE and GE raised invalidity as a defense. The Federal Circuit has clear precedent that “a state waives its Eleventh Amendment immunity when it consents to federal court jurisdiction by voluntarily appearing in federal court.” Regents of the Univ. of N.M. v. Knight, 321 F.3d 1111 (Fed. Cir. 2003). As the court explained in a prior case, “the Eleventh Amendment applies to suits ‘against’ a state, not suits by a state.” Regents of the Univ. of Cal. v. Eli Lilly & Co., 119 F.3d 1559, 1564–65 (Fed. Cir. 1997). of infringement. [Since w]e and the Supreme Court have long treated § 101 eligibility as a “condition of patentability” alongside §§ 102 and 103. Aristocrat Techs. Austl. PTY Ltd. v. Int’l Game Tech., 543 F.3d 657, 661 (Fed. Cir. 2008) (“It has long been understood that the Patent Act sets out the conditions for patentability in three sections: sections 101, 102, and 103.”). This is a quintessential “do it on a computer” patent: it acknowledges that data from bedside machines was previously collected, analyzed, manipulated, and displayed manually, and it simply proposes doing so with a computer. We have held such claims are directed to abstract ideas. . . . That the automation can “result in life altering consequences,” is laudable, but it does not render it any less abstract. In examining the patent, the court was unable to identify any specific technological improvements but rather the particular key features of the system are defined in functional terms. Thus, in addition to being directed to an abstract idea, the claims also fail Alice step two as merely reciting “well-understood, routine, conventional activit[ies]. . . . Here, the claims do no ‘more than simply instruct the practitioner to implement the abstract idea . . . on a generic computer.’ Quoting Alice. In January 2018, Google filed a petition to ask the U.S. Supreme Court to review two adverse rulings by the Court of Appeals for the Federal Circuit in the Oracle Am. Inc. v. Google Inc. case. The first was the Federal Circuit’s 2014 decision overturning a district court ruling that several thousand declarations that Google used for its Android platform, which it derived from 37 of 166 Java application program interface (API) packages, were unprotectable by copyright law. Although disagreeing with the lower court’s copyrightability analysis, the Federal Circuit remanded the case, saying that there was a triable issue of fact on Google’s fair use defense. In the spring of 2016, Google’s fair use defense prevailed before a jury. The second adverse ruling was the Federal Circuit’s decision that no reasonable jury could have found fair use. Google’s petition asks the Court to review both the copyrightability and fair use rulings. Oracle will be filing its brief opposing Supreme Court review later this spring. Amicus curiae (friend of the court) briefs, whether in support of Google’s petition or in support of neither party, were filed this week. are alarmed that the Federal Circuit’s copyrightability ruling has deepened splits in circuit court interpretations of several major copyright doctrines as applied to computer programs. That ruling disrupted the relative equilibrium of more than two decades of software copyright precedents and upset settled expectations within the software industry. Th[e] Court’s guidance is urgently needed to address and resolve circuit conflicts affecting this $564 billion industry. [Our] sole interest in the case lies in [our] concern for the proper application of traditional principles of copyright law to computer programs. Because amici have devoted [our] careers to understanding the balancing principles built into copyright and other intellectual property laws, [our] views can aid the Court in resolving the important issues presented by the Petition. While there is much that IP scholars will have to say on the merits if the Court grants the petition, our brief concentrates on numerous respects in which the Federal Circuit’s ruling is in conflict with Supreme Court and other appellate court rulings. Before presenting the brief’s summary of our argument, it is worth noting that the district court gave three reasons for holding that the Java API declarations were unprotectable by copyright law: first, because they constituted an unprotectable method or system under 17 U.S.C. § 102(b), second, because the merger doctrine precluded copyright protection for the declarations as there was, in effect, no other way to say them, and third, because the declarations were unprotectable under the words and short phrases doctrine. The Federal Circuit rejected all three rationales in its copyrightability ruling. While our brief focuses primarily on the merger issue because the Federal Circuit’s interpretation of that doctrine is so clearly contrary to Supreme Court as well as other appellate court precedents, it also identifies the proper application of § 102(b) method/system exclusion in software copyright cases as another cert-worthy question. In addition, the brief touches on the words and short phrases issue, albeit less extensively. The Federal Circuit’s copyrightability ruling in Oracle has deepened splits in circuit court interpretations of several major copyright doctrines as applied to computer programs. This brief makes three principal points. First, the Federal Circuit’s merger analysis is in conflict with this Court’s ruling in Baker v. Selden, 101 U.S. 99 (1880), and decisions by the First, Second, Fifth, Sixth, and Eleventh Circuits. Second, the Federal Circuit’s interpretation of the scope of copyright protection available to computer programs is at odds with Baker and decisions of the First, Second, Tenth, and Eleventh Circuits. Third, the Federal Circuit’s interpretation of the words and short phrases doctrine cannot be reconciled with holdings of the Third and Sixth Circuits. The merger doctrine holds that expressions in works of authorship are unprotectable by copyright law when, as a practical matter, there is only a limited number of ways to express an idea, fact, or function. When ideas, facts, or functions, in effect, “merge” with expression, copyright protection will be withheld from the merged elements. The merger doctrine fosters socially beneficial competition and ongoing innovation as well as promoting the ongoing progress of science and useful arts, as the Constitution commands. U.S. Const. art. I, § 8, cl. 8. The Federal Circuit’s copyrightability ruling conflicts with Baker in three respects: first, because the Federal Circuit concluded that merger can only be found if a first author had no alternative ways to express an idea when creating the work; second, because it held that constraints on a second comer’s design choices are never relevant to merger; and third, because it ruled that merger is only a defense to infringement, and never raises a copyrightability issue. Post-Baker cases from the First, Second, Fifth, Sixth, and Eleventh Circuits have conceptualized and applied the merger doctrine more broadly than the Federal Circuit. These idea/expression, fact/expression, and function/expression merger cases have resulted in uncopyrightability rulings, which contradict the Federal Circuit’s holding on merger. Beyond merger, the Federal Circuit’s interpretation of the scope of copyright protection available to software innovations conflicts with the rulings of other circuits in four respects. First, the Federal Circuit’s interpretation of the exclusion of methods and systems from copyright’s scope under 17 U.S.C. § 102(b) is contrary to the First Circuit’s interpretation in Lotus Development Corp. v. Borland International, Inc., 49 F.3d 807 (1st Cir. 1995), aff’d by an equally divided Court, 516 U.S. 233 (1996). Second, several circuit courts have ruled in favor of compatibility defenses in software copyright cases. Only the Third and Federal Circuits have rejected them. Third, the Federal Circuit’s conception of “structure, sequence, and organization” (SSO) of programs as protectable expression as long as it embodies a modicum of creativity conflicts with the Second Circuit’s landmark decision, Computer Associates International, Inc. v. Altai, Inc., 982 F.2d 693 (2d Cir. 1992). Altai rejected the conception of SSO as determinative of protectable expression. Id. at 706. Fourth, the Federal Circuit’s assertion that copyright and utility patents can provide overlapping protection to program SSO is in conflict with Baker as well as Tenth and Eleventh Circuit decisions. There is, moreover, conflict among the circuits concerning the protectability of “words and short phrases.” The District Court denied Oracle’s claim in part based on its view that names and short phrases are not copyrightable, but the Federal Circuit held that words and short phrases, such as the names of individual Java declarations, could, if original, be eligible for copyright protection. However, the Third and Sixth Circuits have denied similar claims in cases involving identifiers such as names and numbers. Granting the Petition would enable this Court to resolve this split as well.